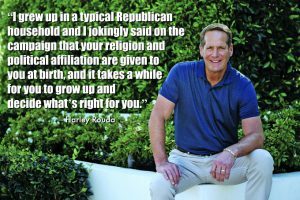 Harley Rouda of Laguna Beach steps into his new role in Congress. 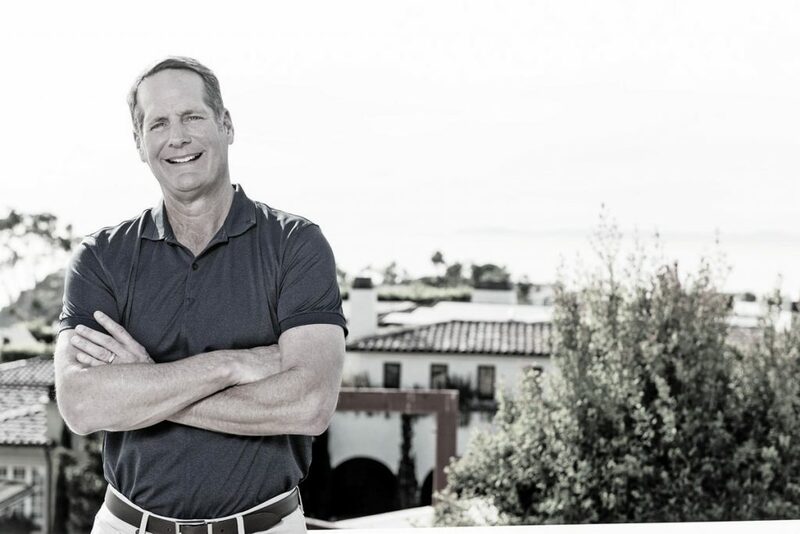 This past November bore witness to a history-making moment when Democratic candidate Harley Rouda beat longtime Republican incumbent Dana Rohrabacher in the 48th District’s Congressional election. It was a position that Rohrabacher had held for 30 years, and Rouda’s victory contributed to Orange County’s flip from red to blue. But to Rouda, it meant much more than that. 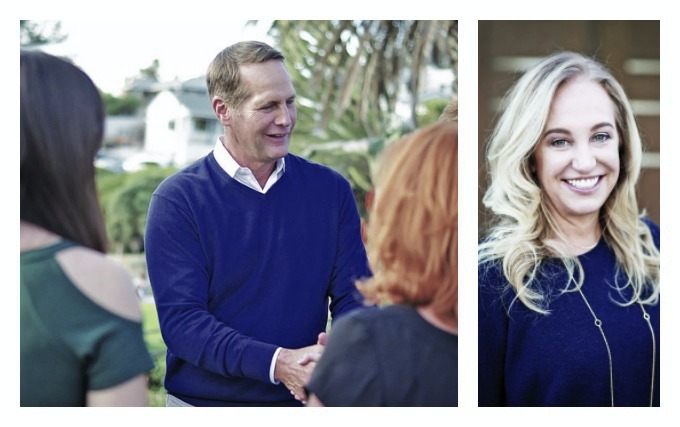 Rouda’s philosophy regarding his campaign was simple: He wanted to be accessible and unifying. He wanted to use his voice to make a difference and to advocate for change. 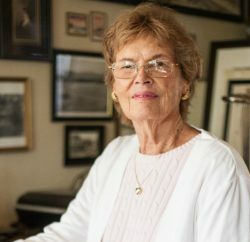 Now, this Laguna Beach resident has an opportunity to fulfill those promises, but it was a long road to reach this point. Rouda and his wife, Kaira, moved with their children to Laguna a decade ago, but it was a city where they had always dreamed of making their home. Unfortunately, they’d have to wait awhile before doing so. When business obligations later required them to relocate to Orange County, moving to Laguna was an easy decision. 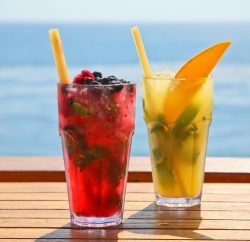 “We loved Laguna Beach since the day we set foot in the city and so we didn’t need to look anywhere else,” Harley says. 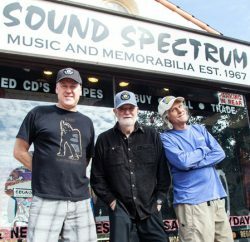 Since settling in, they have become involved in many different causes, including homelessness, which is an issue that is close to their hearts. Kaira acknowledges that the community in Laguna has been very welcoming. “We’ve felt a part of this community from the beginning and the connections continue to deepen,” she says. When asked what he loves most about Laguna, Harley doesn’t hesitate with his response. “Every time I come home, I feel like I’m coming home to a vacation. Although maybe not so much now that I’ve been elected to Congress,” he jokes. 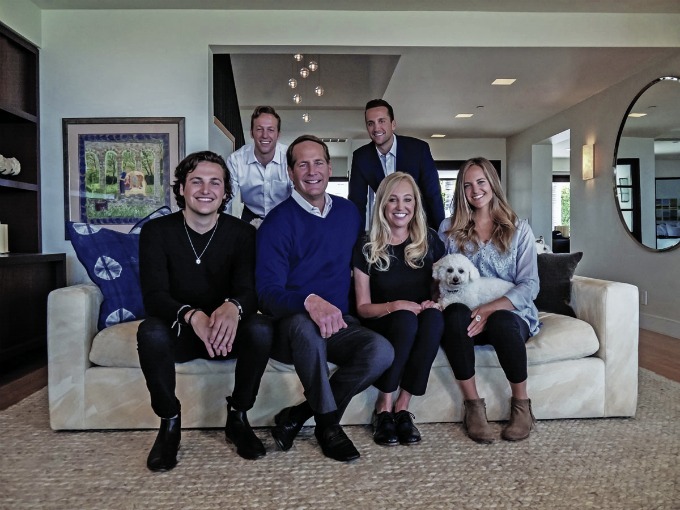 Congressman Harley Rouda at home in Laguna Beach with his family including wife Kiara and their children (left to right) Dylan, Shea, Tracie and Avery. While Harley is focused on his political career, Kaira is a best-selling author with several novels under her belt and one more, “The Favorite Daughter,” on the way this May. The couple have four children: Trace, Avery, Shea and Dylan, who are very close in age. Kaira has also been supportive of Harley’s new role in Congress, even spearheading the Artistic Discovery Contest, a nationwide art competition for high school students in every district. Entries are due this spring and the winner from the 48th District will have their artwork displayed in the U.S. Capitol for one year. In the months before the election, Harley’s transition from Republican to Democrat was the topic of much conversation. “I grew up in a typical Republican household and I jokingly said on the campaign that your religion and political affiliation are given to you at birth, and it takes a while for you to grow up and decide what’s right for you,” he says. He recalls that his political affiliation started changing when he was in his 20s. A large influence in the transition was his relationship with Kaira and their activism. “Meeting Kaira, who was a lifelong Democrat [and] grew up in a Democratic household, certainly opened my eyes up to a different perspective,” he says. Of course, Harley’s views on different issues have evolved over time. Leading up to the election, many locals connected with his stance and approach to bringing about change. Retired Laguna Beach couple Tom and Ginger Osborne volunteered on Harley’s campaign. Passionate about the environment, the couple say they were first drawn to Harley because of his position on climate change, but what struck them the most was his authenticity and a decency that spoke to his character. Harley feels that his past as a Republican will be a help rather than a hindrance. “I think my business and legal backgrounds give me a foundation to talk to people across the spectrum as to why some issues that are way more progressive actually make good economic sense,” he says. Since stepping into the new position in January, Harley has joined the House Committee on Transportation and Infrastructure and believes that two of the subcommittees on which he serves (Highways and Transit, and Water Resources and Environment) oversee issues that are very important to the district. As Harley notes, 60 percent of fossil fuel emissions are from infrastructure in some way—how we source the materials, transport them, build infrastructure and use it, and the deterioration of infrastructure over its lifetime all contribute to fossil fuel emissions. “I believe we have an opportunity to use a bipartisan issue such as infrastructure [as a tool] to address what should be a bipartisan issue: climate change,” Harley says. In addition to serving on committees, Harley’s first bill was passed by the House of Representatives in January, although it must still be considered by the Senate. His legislation, H.R. 206—the Encouraging Small Business Innovation Act—would boost investments in the existing Small Business Innovation Research and Small Business Technology Transfer programs, especially focused on women- and minority-owned businesses. “It’s millions and millions of dollars across the U.S.—10s of millions of dollars in the district—so this should be good for all of us,” he says. Then, in February, Harley introduced another bill, H.R. 1317—The Coastal Communities Adaptation Act—to jump-start research into building structures that can better withstand extreme weather and also allot grant funding for beachside towns that must prepare to deal with rising sea levels due to climate change. Three days before presenting that legislation, Harley hosted a town hall meeting in Costa Mesa to hear about concerns directly from his constituents in the 48th District, which extends along southern Orange County’s coast from Seal Beach to Laguna Niguel and inland, taking in parts of Garden Grove, Westminster and Santa Ana. And, in late January, Harley spoke before the House Committee on Oversight and Reform during a hearing on the rising price of prescription drugs to make his desire for change known. “Patients can’t reap the benefits of pharmaceutical innovation if they’re forced to choose their medication or their mortgage,” Harley said during the hearing. “Our present system presents an unconscionable choice and we cannot let it stand. We need to take a hard look at the costs in the entire health care system and reassess the prices we pay. Left: Harley meets with voters before the November election. Right: Kiara Rouda, Harley’s wife, is an author. Certainly Harley’s background has equipped him for that endeavor. He describes his strengths as stemming from the experience of building small companies up to 10,000 people. “It gave me a clear understanding of how businesses work, what it takes to build teams [and] what it takes to have a clear vision of what you want to accomplish,” he says. Harley describes his leadership style as being collaborative with others to achieve a mutual end result. “And I’m hopeful that I can bring those leadership skills to what I’m doing here,” he says. Harley admits that his learning curve is a bit higher than someone who has served in a state legislature but says that he is a fast learner. “I feel comfortable with what I’m doing and have been asked to do, and I’m looking forward to learning more and serving the constituents of the 48th District,” he says.